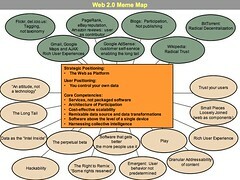 Result of a "What is Web 2.0?" brainstorming session at FOO Camp 2005. Meme maps adapted from business model maps developed by Beam Inc.